This article is about the former sports venue that opened in 1902 and closed in 1966. For the current venue in Glendale, AZ that opened in 2006 that's also called Sportsman's Park, see University of Phoenix Stadium. For the race track outside Chicago, see Chicago Motor Speedway. 3623 Dodier St. (Cardinals) & 2911 N Grand Blvd (Browns). Sportsman's Park was the name of several former Major League Baseball ballpark structures in the central United States, in St. Louis, Missouri. All but one of these were located on the same piece of land, at the northwest corner of Grand Boulevard and Dodier Street, on the north side of the city. From 1920–1953, Sportsman's Park was the home field of both the St. Louis Browns of the American League, and the St. Louis Cardinals of the National League, after which the Browns departed to become the modern-day Baltimore Orioles. The physical street address was 2911 North Grand Boulevard. 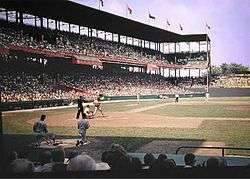 This ballpark (by then known as Busch Stadium, but still commonly called Sportsman's Park) was also the home of the St. Louis Cardinals of the National Football League from 1960 through 1965, after the team's relocation from Chicago and before Busch Memorial Stadium opened its doors in 1966. In 1923, the stadium hosted St. Louis's first NFL team, the St. Louis All-Stars. Baseball was played on the Sportsman's Park site as early as 1867, 149 years ago. The tract was acquired in 1866 by August Solari, who began staging games there the following year. It was the home of the St. Louis Brown Stockings in the National Association and the National League from 1875 to 1877. Originally called the Grand Avenue Ball Grounds, in 1876 it was renamed Sportsman's Park. The first grandstand—one of three on the site—was built in 1881. At that time, the diamond and the grandstands were on the southeast corner of the block, for the convenience of fans arriving from Grand Avenue. The park was leased by the then-major American Association entry, the St. Louis "Brown Stockings", or "Browns". The Browns were a very strong team in the mid-1880s, but their success waned. When the National League absorbed the strongest of the old Association teams in 1892, the Browns were brought along. Soon they went looking for a new ballpark, finding a site just a few blocks northwest of the old one, and calling it New Sportsman's Park, which was later renamed Robison Field. They also changed team colors from Brown to Cardinal Red, thus acquiring a new nickname, and leaving their previous team colors available, as well as the old ballpark site. The 1902 version of Sportsman's Park, with the diamond located on the northwest corner. When the American League Browns moved from Milwaukee in 1902, they built a new version of Sportsman's Park. They initially placed the diamond and the main stand at the northwest corner of the block. This Sportsman's Park saw football history made. It became both the practice field and home field for Saint Louis University football teams, coached by the visionary Eddie Cochems, father of the forward pass. Although the first legal forward pass was thrown by Saint Louis's Bradbury Robinson in a road game at Carroll College in September 1906, Sportsman's Park was the scene of memorable displays of what Cochems called his "air attack" that season. These included a 39–0 thrashing of Iowa before a crowd of 12,000 and a 34–2 trouncing of Kansas witnessed by some 7,000. Robinson launched an amazingly long pass in the game against the Jayhawks, which was variously reported to have traveled 67 or 87 yards in the air. College Football Hall of Fame coach David M. Nelson called the pass extraordinary, "considering the size, shape and weight" of the fat, rugby-style ball used at that time. Sports historian John Sayle Watterson agreed. In his book, College Football: History, Spectacle, Controversy, Watterson described Robinson's long pass as "truly a breathtaking achievement". St. Louis finished with an 11–0 record in 1906, outscoring its opponents 407–11. In 1909, the Browns moved the diamond to its final location, at the southwest corner, in the shadow of a new steel and concrete grandstand—the third such stadium in the major leagues, and the second in the American League (after Shibe Park). The previous wooden grandstand was retained as left-field bleachers for a while, but was soon replaced with permanent bleachers. The Cardinals came back to their original home in mid-1920, as tenants of the Browns, after abandoning the outdated, mostly-wooden Robison Field. After nearly winning the American League Pennant in 1922, Browns owner Phil Ball confidently predicted that there would be a World Series in Sportsman's Park by 1926. In anticipation, he increased the capacity of his ballpark from 18,000 to 30,000. There was a World Series in Sportsman's Park in 1926—but it was the Cardinals, not the Browns, who took part in it, upsetting the Yankees in a memorable seventh game. Although the Browns had been the stronger team in the city for the first quarter of the century, they had never been quite good enough to win a pennant. After the previously weak Cardinals had moved in, the two teams' situations had started to reverse, both on and off the field. The Cardinals' 1926 World Series victory more or less permanently tipped the balance in favor of the Cardinals. From then on, the Cardinals were clearly St. Louis' favorite team, while still tenants of the Browns. The 1944 World Series between the Cardinals and the Browns, won by the Cardinals 4 games to 2, was perhaps a good metaphor for the two clubs' respective situations. It remains the last World Series to be played entirely in one facility as the home venue for both competing clubs. The 1946 World Series at Sportsman's Park. In addition to its primary use as a baseball stadium, Sportsman's Park also hosted several soccer events. These included several the St. Louis Soccer League and the 1948 National Challenge Cup when St. Louis Simpkins-Ford defeated Brookhattan for the national soccer championship. In 1936, Browns owner Phil Ball died. His family sold the Browns to businessman Donald Lee Barnes, but the Ball estate maintained ownership of Sportsman's Park until 1946, when it was sold to the Browns for an estimated price of over US$1 million. By the early 1950s, it was clear that the city could not support both teams. Bill Veeck, owner of the Browns (who at one point lived with his family in an apartment under the park's stands), fancied that he could drive the Cardinals out of town through his promotional skills. He caught an unlucky break when the Cardinals' owner, Fred Saigh, pleaded no contest to tax evasion. Faced with certain banishment from baseball, Saigh sold the Cardinals to Anheuser-Busch in February 1953. Veeck soon realized that the Cardinals now had more resources at their disposal than he could hope to match, and decided to move the Browns out of town. As a first step, he sold Sportsman's Park to the Cardinals for $800,000. Veeck would have probably had to sell the park anyway, as the Browns could not afford to make repairs necessary to bring the park up to code. Busch had the money, and the ballpark was soon renovated. Meanwhile, by the next year, the Browns relocated to Baltimore and were renamed as the Orioles, which has been the name of the team ever since. The brewery originally wanted to name the ballpark Budweiser Stadium.Commissioner Ford Frick vetoed the name because of public relations concerns over naming a ballpark after a brand of beer—an ironic stance, given all baseball clubs' significant revenues from beer sales. However, the commissioner could not stop Anheuser-Busch president August Busch, Jr. from renaming it after himself, and so he did; however, many fans still called it by the old name. Although the ballpark's official final name was Busch Stadium, it was known for most of its history as Sportsman's Park, and that is the term normally used to refer to it most often. The Anheuser Busch "eagle" model that sat atop the left field scoreboard flapped its wings after a Cardinal home run. The park's site is now occupied by a Boys and Girls Club, including an athletic field at the same location of the original playing field (top). A sign at Grand & Dodier marks the stadium's site (bottom). Sportsman's Park / Busch Stadium was the site of a number of World Series contests, first way back in the mid-1880s, and then in the modern era. The 1964 Series was particularly memorable, the park's last, and featured brother against brother, Ken Boyer of the Cardinals and Clete Boyer of the Yankees. The Cardinals' triumph in seven games led to Yankees management replacing Yogi Berra with the Cardinals' ex-manager Johnny Keane (he had resigned after winning the Series), an arrangement which lasted only to early 1966. The stadium also hosted Major League Baseball All-Star Games in 1940, 1948, and 1957. Sportsman's Park / Busch Stadium was replaced early in the 1966 season by Busch Memorial Stadium, during which time much was made of baseball having been played on the old site for more than a century. A helicopter carried home plate to Busch Memorial Stadium after the final Sportsman's Park game on May 8, 1966. The 1966 stadium was replaced forty years later by the new Busch Stadium in April 2006. Donated by the August Busch, the Sportsman's Park site is now home to the Herbert Hoover Boys and Girls Club. While the grandstand was torn down 50 years ago in late 1966, the diamond was still intact at the time the structures were cleared, and the field is now used for other sports. The following links provide images of the field's markers. The diamond was conventionally aligned east-northeast (home plate to center field), and the elevation of the field was approximately 500 feet (150 m) above sea level. 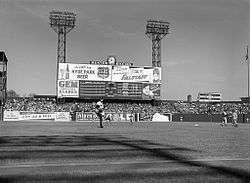 The left field and right field walls ran toward center, roughly perpendicular to the foul lines or at right angles to each other. The center field area was a short diagonal segment connecting the two longer walls. When distance markers were first posted, there was a 426 marker at the left corner of that segment, and a 422 marker at the right corner of it. There was another 422 marker a few feet to the left of the other one, and that marked "true" center field. For symmetry, a corresponding marker (425) was set a few feet to the right of the 426. The two corner markers were eventually painted over, leaving just the 425 and the true centerfield 422. Left-handed power hitters enjoyed hitting here. Stan Musial benefited from playing the home-team half of his entire career here. Other sluggers took advantage, notably Babe Ruth, who hit three homers in game 4 of the 1926 World Series as well as game 4 of the 1928 World Series. When facing the Browns during the regular season, Ruth also hit well here. On one occasion he drove one across Grand Boulevard that shattered the window of a car dealership. The owner had the glass replaced by the next day, just in time for Ruth to shatter it again. On another occasion, Ruth launched one into his straightaway-center power zone that landed behind the center field bleachers, some 500 feet from home plate. ↑ Hetrick, J. Thomas (1999). Chris Von der Ahe and the St. Louis Browns. Lanham, Maryland. : Scarecrow. p. 151. ISBN 0-8108-3473-1. ↑ "Browns purchase Sportsman's Park". Milwaukee Journal. Associated Press. October 3, 1946. p. 8, part 2. 1 2 3 Lowry, Philip (2006). Green Cathedrals. Walker & Company. p. 202. ISBN 978-0-8027-1608-8. ↑ "Cardinals purchased by brewery $3,750,000". Spokane Daily Chronicle. Spokane, Washington. Associated Press. February 20, 1953. p. 11. ↑ "Cards sold to St. Louis brewery". Milwaukee Sentinel. Associated Press. February 21, 1953. p. 3, part 2. ↑ "Cards buy Sportsman's Park for $800,000, 'save' Browns". Milwaukee Sentinel. Associated Press. April 10, 1953. p. 2, part 2. ↑ "Cards buy Sportsman's Park from Browns in $800,000 transaction". The Day. New London, Connecticut. Associated Press. April 10, 1953. p. 15. ↑ "Beer company plans to deal baseball's Cardinals". Lodi News-Sentinel. Associated Press. October 26, 1995. p. 13. 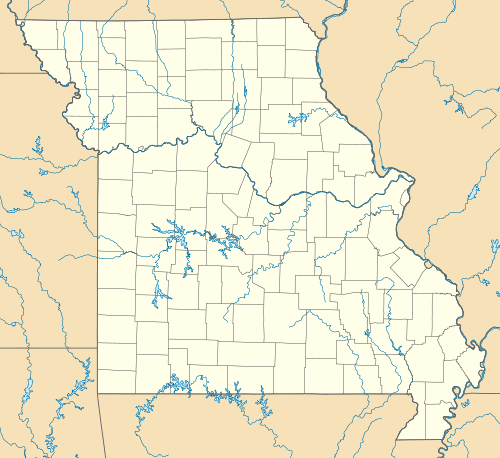 ↑ "Budweiser tag given baseball park in St. Louis". Times-News. Hendersonville, North Carolina. United Press. April 10, 1953. p. 8. ↑ "Giants win 8th in a row". Milwaukee Sentinel. UPI. May 9, 1966. p. 2, part 2. ↑ Haudricourt, Tom (April 11, 2006). "Same name, fresh look". Milwaukee Journal Sentinel. p. 5C. ↑ Temple, Wick (January 30, 1966). "Old stadium due change this year". Tuscaloosa News. Alabama. Associated Press. p. 15. ↑ "Sportsman Park is alive, although Cards have gone". Tuscaloosa News. Alabama. Associated Press. May 9, 1976. p. 11B. 1 2 "38.658 N, 90.220 W". Historic Aerials. Retrieved January 9, 2016. ↑ "Objectives of the Game – rule 1.04". Major League Baseball. Retrieved January 9, 2016. Dimensions drawn from baseball annuals.